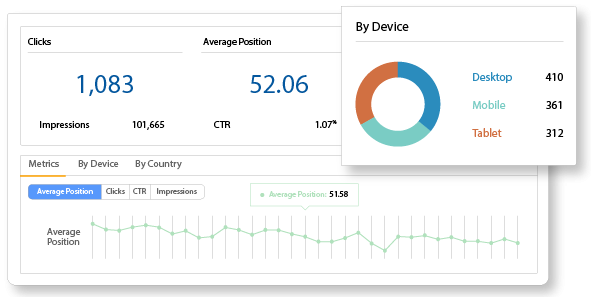 Move away from 5% visibility with Google Search Console to ~100% visibility. Applied with deep-learning, seoClarity’s Search Analytics gives you a clear picture of all search terms that drive traffic to your site. Correlate keyword level data with all of your other SEO metrics with our advanced machine-learning capabilities. Finally report and analyze your brand keywords performance and gain insights into your non-brand performance. See how well your page is optimized for the actual keyword(s) its targeting. As part of seoClarity’s machine-learning capabilities, Search Analytics is the ONLY enterprise platform to reveal 90-100% match of keywords actually driving traffic to your site. Built on the Clarity Grid, you can connect to a multitude of data sources to manage and drive performance on the exact search terms to initiate greater search visibility. And, it allows you to filter, dynamically update, and apply interactive analysis on the fly.